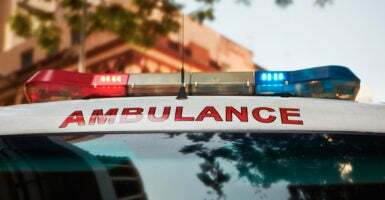 A 3-year-old boy died after the ambulance he was riding in was struck by a drunken illegal immigrant in North Carolina, police said. Jose Duran Romero, 27, allegedly crashed his Honda Accord into the side of a LifeCare Ambulance in Winston-Salem, North Carolina, early Sunday morning, reports the Charlotte News & Observer. A breathalyzer test administered two hours after the crash revealed Romero’s blood-alcohol content was 0.19—more than twice the legal limit—according to Winston-Salem police. The toddler had been in stable condition before the crash but suffered life-threatening injuries in the wreck, police Lt. Rick Newnum said Monday. Police did not have further information about why the boy, who has not been publicly identified, was being transported to the hospital. Police say Romero and his passenger, Andres Figueroa Leon, 33, attempted to run away after the crash. A witness prevented one of the men from leaving, while responding officers established a perimeter and caught the other man a few minutes later, Newnum said. Romero was initially held on $50,000 bail, which was revoked when Immigration and Customs Enforcement (ICE) officials placed an immigration detainer on him, reports the Daily Mail. ICE says Romero is a citizen of El Salvador. Romero has been charged with driving while intoxicated, failure to reduce speed to avoid a crash, and driving without a license. It remains unclear if prosecutors intend to file additional charges now that the toddler has died. The death of the 3-year-old boy is the second recent fatal incident involving a drunk driving illegal immigrant in the past week. Earlier this month, Indianapolis Colts linebacker Edwin Jackson and another man were killed when an intoxicated Guatemalan national allegedly slammed into both men as they stood on the shoulder of Interstate 70. The suspect in that case had been deported two times before the incident.